The small country of Bosnia and Herzegovina is one of the most picturesque on the Balkans. Despite the fact that access to the sea at this state is limited, thousands of tourists come here every year for a quiet and relaxing holiday. In recent years, many of them are buying real estate in Bosnia and Herzegovina. In comparison with the Montenegrin and Croatian real estate market, prices of apartments from the owner and the builder in Bosnia and Herzegovina are much lower and affordable even to people with modest financial possibilities. Of course, most of foreign home buyers choose to spend their holiday exactly in this sunny and hospitable Balkan country. Having their own holiday house or apartment by the sea and in the mountains of Bosnia and Herzegovina is very advantageous. On one hand, owners of vacation homes annually reduce their living costs and can relax in any, convenient for them time of the year. On the other hand, during their absence from Bosnia and Herzegovina, they can let their housing and receive a good extra income. 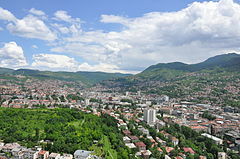 Bosnian real estate market is increasingly attracting those who want to live in a peaceful country with a good environment. Buying townhomes in the country is as easy as buying holiday homes. Moreover, owners of property in Bosnia and Herzegovina can easily receive residence permit. And for this purpose, in addition to home ownership, they need to open their own business in the country. When these conditions are fulfilled, foreigners can get a residence permit for a period of three years that can be extended later or to obtain a permanent one. There are no restrictions or special requirements for foreign buyers in Bosnia and Herzegovina. You can buy residential housing from the owner or the builder and any commercial facilities. Moreover, non-residents are allowed to invest in land with area less than five hundred square meters. In order to complete the sale transaction is only necessary to provide a valid passport or constituent documents of a legal entity.